It would be nice if we could show LLDP/CDP neighbors in the WEB UI. We pull the data when discovery runs why not store it and show it.? All that is needed now is some webui to display it. Been thinking about the same. A table with the LLDP neighbours and the ability to “exclude” some of those devices from auto-disco for example. 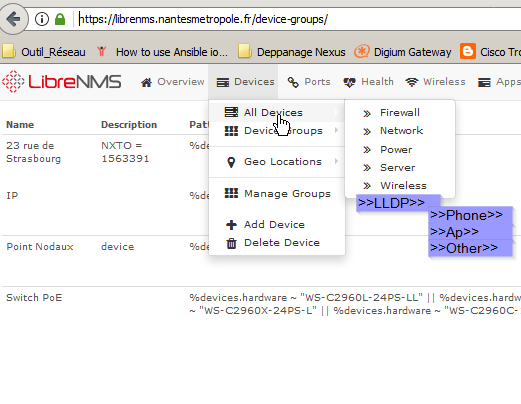 This data is already shown under device-> ports-> neighbors. Or are you talking about something different? Kinda but im thinking more like what Rosiak is talking about. I allow me to participe at this poste. I have around 650 network devices in my network. This is a good idea of store devices learn by LLDP/CDP. But, I think with the mib LLDP , we retrieve data as model, version. I was thinking the same thing. It would be nice to list them all in one place and to be able to search. An example I’m familiar with is in Cisco Prime and it’s one of the features I’m hoping for in LibreNMS. In prime you can search mac, ip, or hostname in the search box. It will display the port and switch the device is connected to. It’s extremely useful to find a device on the network fast. search mac, ip, or hostname in the search box. Maybe something is misconfigured on my setup but most of the entries in my fdb table are only macs. The ones that do show IP addresses in the table are switches and the ip used for switch management. What I am thinking is a table like fdb with all the lldp neighbors listed for every device is one place. That way we could have the hostname, Mac, IP, switch, and port listed all on one page. I feel going switch to switch > ports > neighbors is very useful in some cases but overly tedious on others so both options being available is better. Similar to the mockup above but with an “All Devices” list as well. I feel it would prove helpful in cases when you want to find devices on the wrong vlan such as a printer or phone plugged into a port configured for an AP. A real world example I’ve seen is that the DHCP scope for assigning APs addresses is running low because someone mispatched phones or computers on the wrong ports. You can then take the info from DHCP and search for what port they are on and fix them. Another example is that you want to make sure all Cisco phones are on the correct vlan. In this case you could search for any hostname starting with sep, then sort by IP, now you can scroll to the section with the wrong IPs and quickly see all the ports that need to be changed. I hope my rambling makes sense. IP Address and MAC Address tables store IPs and MACs directly assigned to devices added to LibreNMS. xDP only shows info about neighbors and ports, on devices that support the MIB. Yes, it would be great to get all this data in one place and I originally wanted that when the FDB feature came in, but it is very complex. No one has attempted yet. is this in the docs? Not sure, it is really just general networking knowledge (perhaps not common), not specific to LibreNMS. @murrant yes I get that… I’m talking more like in this screen shot… I was thinking of writing up a section on those search features. Sorry for late reply in old thread. But where is this information (lldp/cdp) stored in the DB? I can’t find the tables involved.